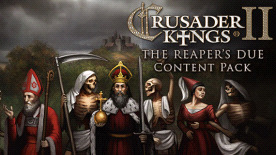 Death and disease is spreading throughout your kingdom in Crusader Kings II: The Reaper's Due, and with the release of Paradox Development Studio's expansion comes an accompanying Content Pack. The Content Pack contains a Portrait Pack detailing the east African provinces and a Clothing Pack focusing on the late Byzantine Empire. In addition to these, there are fifteen new models for both Eastern and African councilors.